The VW wind tunnel centre in Wolfsburg will be used by the car manufacturer for measuring aerodynamics, acoustics and fuel efficiency in accordance with WLTP. Volkswagen has opened a new Wind Tunnel Efficiency Centre in Wolfsburg, which is one of the most modern and efficient in the industry. The centre, with a floor area of 8,800 m², is also certified for measurements in accordance with WLTP (Worldwide Harmonised Light Vehicle Test Procedures). Vehicles can be tested at wind speeds of up to 250 km/h, simulating real traffic conditions with a view to reducing drag, fuel consumption and emissions. In addition, driving simulations under all the climatic and environmental conditions normally experienced throughout the world can be conducted – at temperatures between -30°C and +60°C. Dr Herbert Diess, CEO of the Volkswagen brand, says: “By 2020, we will renew our entire product portfolio as well as expanding it in key segments. All in all, our development teams are working on more than 50 vehicle projects.” The Wind Tunnel Efficiency Centre offers optimum conditions for further improving the consumption figures of the growing model range, among other items. In the aerodynamics and acoustics wind tunnel, the flat belt balance particlarly ensures that real-world driving operation can be simulated. Each individual wheel of the vehicle is positioned on its own flat belt. This allows turning motions of the wheels in a way that is similar to driving on the road. The balance, with integrated camera system, aligns each model tested fully automatically in less than five minutes. The previous system required about 30 minutes. And the acoustic insulation of the tunnel makes it one of the quietest automotive wind tunnels in the world. At a wind speed of 160 km/h, the tunnel only reaches a sound pressure level of 65 decibels, comparable with TV operated at a reasonable volume or normal speech. The thermal wind tunnel, which will be able to simulate snow in addition to rain and sunlight following a pilot phase, will allow significantly more real-life tests than its predecessor. The main component of the tunnel is a highly advanced all-wheel-drive roller dynamometer, which also meets all the requirements for road tests. With the new centre, the Volkswagen brand will significantly reduce the cost of tests previously carried out in remote areas. In addition, cooperation between development areas such as vehicle safety, design, acoustics and comfort will be facilitated as a result of the shorter distances involved; this also applies to the central workshop area. The foundation stone for the centre was laid in June 2014. 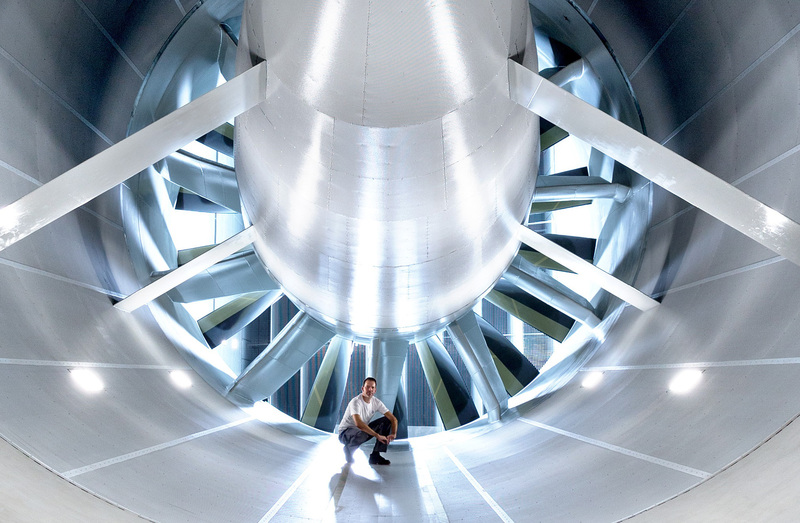 Wind tunnels are still essential for homologation and a wide variety of detailed improvements to vehicles. For example, an aerodynamic drag value can be determined in about 20 minutes. A computer calculation would take days.